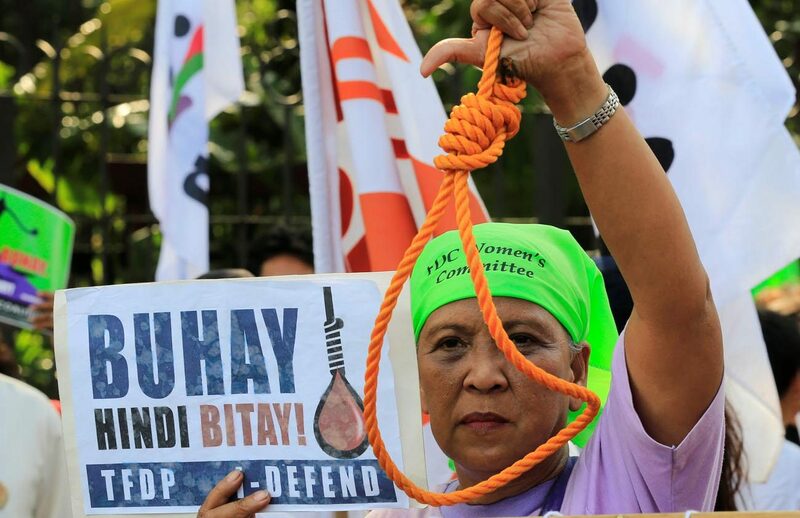 UPDATED – The Philippines stands poised to reinstate the death penalty after it was put on hold 11 years ago. The church in the Philippines, which has grown more vocal in recent months, continues to oppose the measure that passed the Philippine House on the third and final reading March 7 and is widely expected to move quickly through the Senate. This latest version specifically targets drug crimes. “We, your bishops, are overcome with grief, but we are not defeated nor shall we be silenced,” Archbishop Villegas said. “In the midst of Lent we prepare to celebrate the triumph of life over death, and while we grieve that the lower House has voted for death, our faith assures us that life will triumph,” he said. At the same time, the archbishop called on the Filipinos who stand for life to continue the “spirited opposition” to the death penalty. In the months and weeks leading up to the Congressional votes on the measure, the bishops’ conference has posted statements opposing the death penalty and led marches against it, reiterating that life is sacred and that the death penalty would not put an end to crime. Some leaders have also urged the faithful to go to their representatives and voice their opposition. The conference also signaled that should the death penalty become law again, it would support any effort to oppose the law at the Supreme Court level. Throughout its history, the Philippines has imposed and suspended the death penalty, and the church has consistently opposed it. Since taking office in late June, Philippine President Rodrigo Duterte has pursued drug dealers and addicts with laser-like focus. In July, his close associates in Congress filed a bill to reinstate the death penalty, to support his tough-on-crime stance. So far in Duterte’s “war on drugs,” which started even before he was sworn in, more than 7,000 mostly poor people have been killed in both police operations and unexplained killings of alleged drug offenders. Currently, drug offenses carry sentences ranging from 12 years to life in prison, along with fines. Archbishop Ledesma, a strong critic of Duterte in the final days before the May elections, told Catholic News Service instead of putting drug criminals to death, the country needs to address the “root causes of poverty” and pursue rehabilitation. Duterte has said he was not interested in killing drug users and dealers to make examples of them, but that he simply wanted them to pay for their crimes. Father De La Cruz told CNS the church believes there is always ” hope for change” for the drug offenders. The Manila-based priest, who comes from a well-off family, said that more than two decades ago, he was a meth addict for 10 years. Then he found himself in a church listening to a talk on evangelization and decided he would seek help there to get clean. That was also the start of his discernment to the priesthood. Father De La Cruz is one of the creators of Sanlakbay, which incorporates spiritual formation, counseling, work skills training, arts and cultural outlets and sports activities into a parish-based rehabilitation program. As of March 6, he said five parishes in metropolitan Manila were involved in Sanlakbay and another five would also take part in the coming weeks. But the priest noted that the numbers of those who originally turned themselves in and went for church rehab dwindled significantly when it came to following through with the program. Congressman Harry Roque, a human rights attorney specializing in international law, said he was prepared to take a case to the Supreme Court should the death penalty become law. He said having the death penalty violates the constitution based on the Philippines’ international treaty obligations. He told CNS he did not think the death penalty was the answer to criminality.